The town park, downtown Anchorage has several ice sculptures on display currently. There is a nice path shoveled among them for your viewing pleasure. I enjoyed the walk but can attest that the rink area, although not roped off, is way to slick for walking. 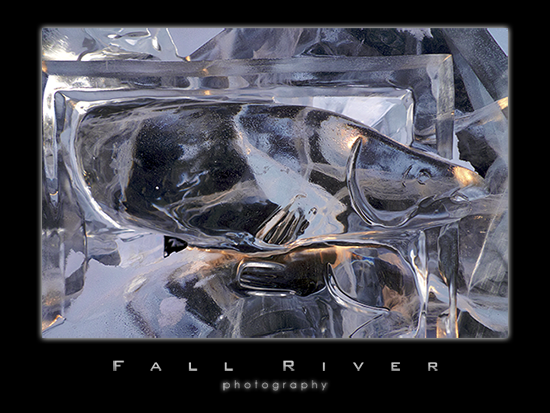 I have on my schedule a trip up to Fairbanks for this years Ice sculpting competition and I wanted to get a feel for the challenges of making photographs of them. Big One: backgrounds. very hard to make a photograph of the sculpture without some serious background intrusions. It is going to be difficult. Next is the light. Which of course gets compounded by trying to change angles to avoid backgrounds. Next is depth or shape. If you don’t get the light it merges flat. Interesting problems. This entry was posted on Saturday, January 16th, 2010 at 11:32 am	and is filed under Alaska and tagged with Alaska, Anchorage, ice sculptures. You can follow any responses to this entry through the RSS 2.0 feed.